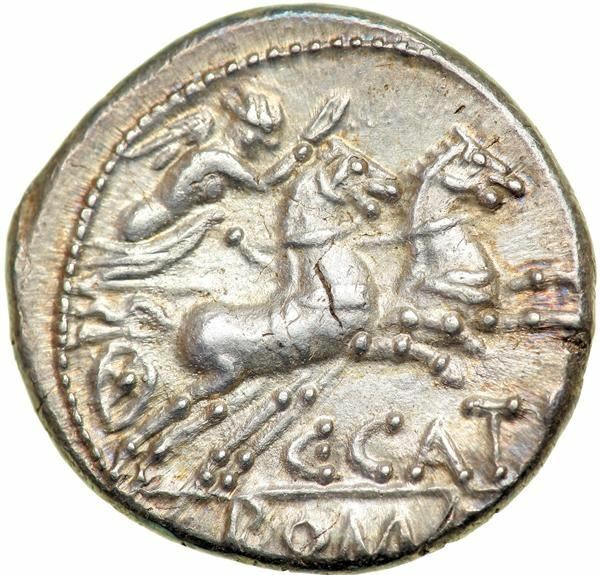 Caius Porcius Cato was one of the moneyers for the year 123 BC. He later served as Consul in 113 BC. As Praetor, he assigned to the province of Macedonia and campaigned unsuccessfully against the Scordisci. He was accused of extortion in Macedonia, and was sentenced to pay a fine. He sought refuge at Tarraco in Spain, and became a citizen of that town. Gens Porcia, rarely written Portia, was a plebeian family at Ancient Rome. Its members first appear in history during the third century BC. The first of the gens to achieve the consulship was Marcus Porcius Cato in 195 BC, and from then until imperial times, the Porcii regularly occupied the highest offices of the Roman state.